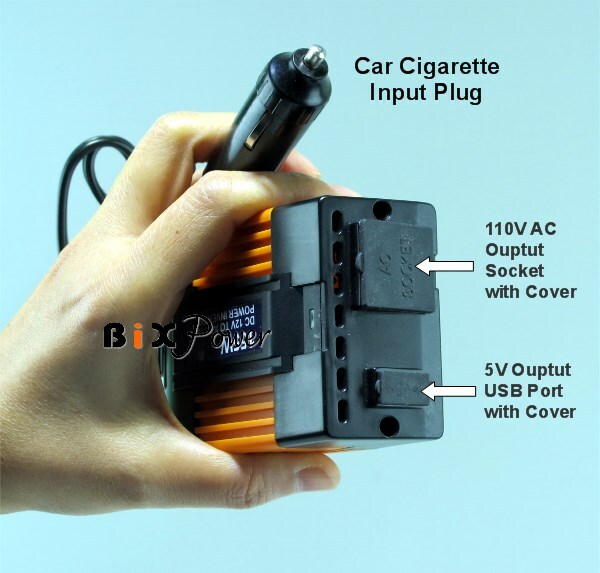 This quite power inverter can convert DC power from a car cigarette lighter socket or a 12V battery ( Voltage range can be 10V ~ 17V) into 110V 60Hz AC power. Maximum 155W output power. 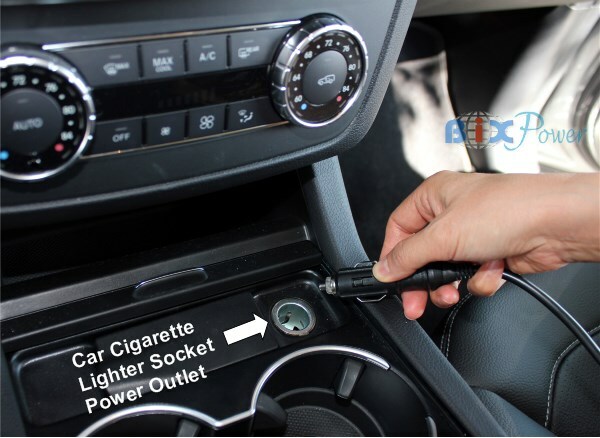 Its input side is a car cigarette light plug, which can directly plug to a car cigarette lighter socket. Its output side is a universal 3-hole AC socket which accept both 2-pin and 3-pin AC plugs. 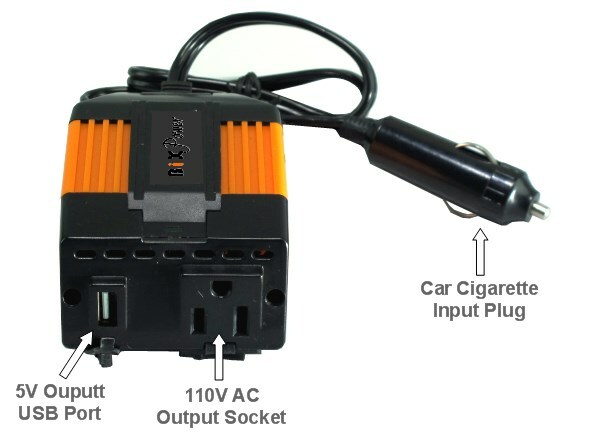 With this DC to AC power inverter, you can power your electronic devices with their original power adapters from a car cigarette lighter socket or a 12V battery. This inverter has small size: 4" x 2.6" x 1.5" , light weight: 0.3kg or 0.5 lb. It is very easy to carry. Important Note: Power inverter itself does not generate any power. All its power output is from the battery it connected to. The power inverter just change the power format and its efficiency rate is about 90%. 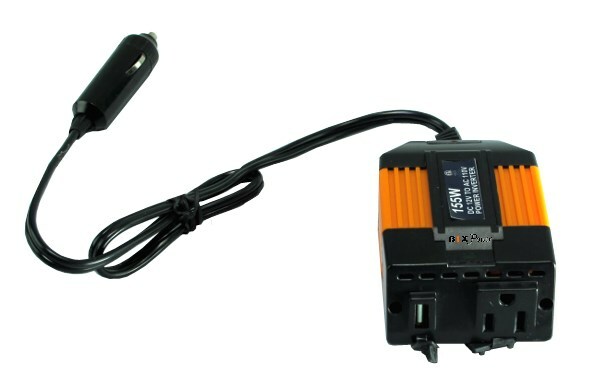 This power inverter rated output is 155W. However, the actual power output from the inverter is also limited by the battery output. To get 155W power from this inverter, the connected battery output need to be around 175 ~ 190W. Most car cigarette lighter may only supply maximum 120W power. Most electronics work just fine with a modified sine wave. If the device that you want to power uses a power adapter that changes the AC into DC, such as a laptop computer, it�s extremely unlikely that you�ll have any issues. However, anything that uses an AC motor isn�t going to work to full capacity on a modified sine wave. Appliances like refrigerators, microwaves, and compressors that use AC motors won�t run as efficiently on a modified sine wave as they would on a pure sine wave (or your line power at home). In some cases, that may lead to a buildup of excess waste heat that could damage the equipment. You�re probably okay to use these devices with a modified sine wave inverter, but you do so at your own risk. The other main thing to be concerned about with modified sine wave inverters is delicate medical equipment. For instance, if you use a CPAP to help correct apneas when you�re asleep, you�re going to be better off with a pure sine wave inverter. Some CPAP manufacturers warn that you can damage your machine with a modified sine wave inverter, and others specify that the CPAP will work but the humidifier unit could be damaged. In these cases, you�re better off using pure sine wave power or looking for a unit that can be powered by DC without need for an inverter at all.